I just bought a flickr pro account, because suddenly I don’t have enough space for all my stuff. And then I get 10 free Moo cards, which I’ve ordered, and that made me realize that I need to upload some more attractive images to my flickr account, because it’s slim pickins. I think I would have gone pro sooner, had I realized just how cheap it is. I’ve had magazine subscriptions that cost more. My first real lace project. The last row I knit needs to be re-done, because I’m short one stitch. 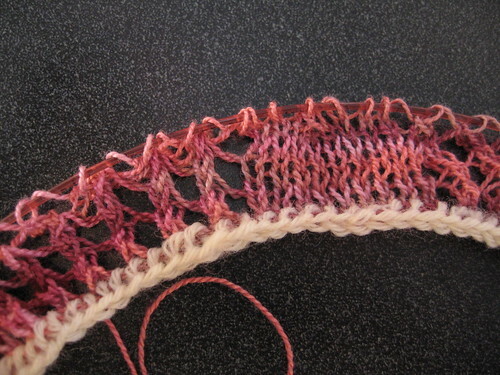 But one stitch isn’t too bad, and I’m still motivated to continue to work on it. Detail of the project. 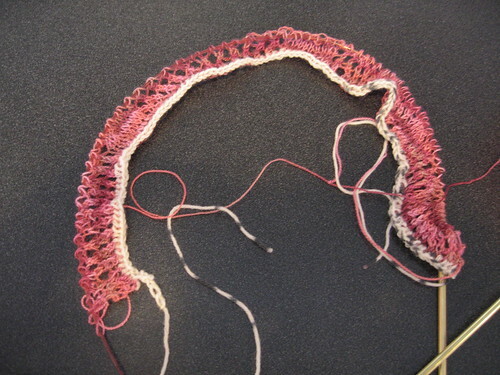 It’s Muir from Knitty, and I think it’s great for a first time real lace with real laceweight project. 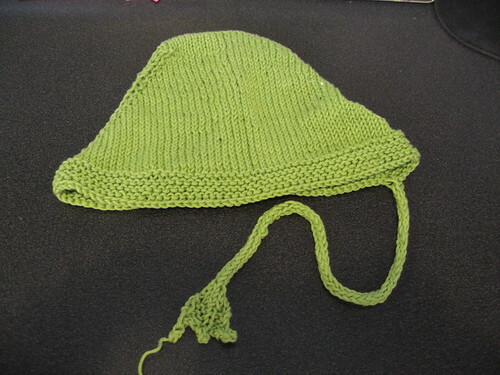 A still unfinished frog hat for a friend. I forget the pattern, but it was originally a Totoro hat, only I changed it, and you can look it up on my Ravelry notebook, if you want. 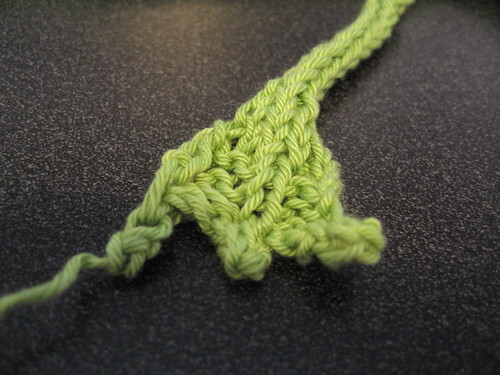 A detail of the frog’s foot, at the end of the ties. I also have loaded photos of the Super Secret project, but only onto Ravelry, so that I don’t ruin anyone’s surprise. This weekend, I plan on doing much knitting, so that I can show progress on some of this come Monday. That will be awesome. Kinda makes you want to do it and send one in, right? I know I do. I have a great picture of me in a sundress and giant heart-shaped sunglasses that I kind of want to replicate. This entry was posted in General stuff and tagged childhood, lace, projects, ravelry. Bookmark the permalink.